Considering that the age of the supercar is meant to be over, it was a joy to see so many at the 2004 British Motor Show. 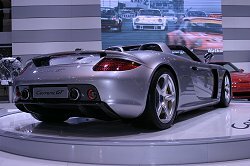 The current daddy of them all, the Carrera GT, made its UK debut on the Porsche stand. Also on display was a body-less chassis, which many considered to be as beautiful as the complete item. The carbon fibre monocoque is a work of art and the cutaways of the engine, carbon clutch and brakes were a display of true engineering brilliance. The all-new 450 bhp 996 Turbo S was also shown in hard and soft-top forms. Across the hall sat two McLaren Mercedes SLRs, both in their trademark 'silver arrow' paintwork. 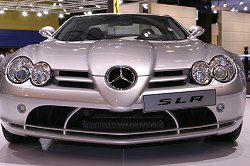 This was the first time the SLR was seen in the flesh in this country and it has awesome presence. £313,000 guarantees exclusivity and a 600 bhp AMG V8, complete with side-exit exhausts and a NASCAR soundtrack. Directly opposite the SLR were the Ferrari and Maserati stands. 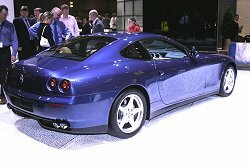 The Ferrari 360CS was displayed alongside a revised 575, aimed at answering criticisms of the original 575's softer set up. The real focal point on the stand, however, was the 612 Scaglietti. We spent many minutes soaking up all the details on this car and concluded it looks much better in the metal than it does on the screen. The subtlety of the body's curves is marvellous, but you still wouldn't call it a classically beautiful Ferrari. The most amazing thing about it was the interior space: the 612 is a genuine four-seater. Maserati showed the coupe and the stunning Quattroporte, which proved to be very popular. The highlight for us though, save for the non-production MC12 GT race car, was the fantastic GranSport coupe aimed at the more committed driver, featuring many chassis and detail changes to enhance its performance. Not far away Lotus displayed the new Exige, including one variant showing a proposed performance pack with bodywork stripes. The Exige promises to offer one of the great driving experiences. The new Toyota-powered 111R was also on display. The Car Enthusiast will be driving both these cars this year, so watch out for the reviews in the main Road Tests page. Over in the vast Ford Motor Company Hall, a solitary white GT took pride of place between the sporty Fiestas. If you have not got your name down already, don't come crying to us now... Though the GT looks like a slightly better put together GT40, it is actually quite different in the metal; the GT is unmistakably a Ford, yet it is every inch a supercar. I may have drooled. It was dark and I don't think anyone saw. 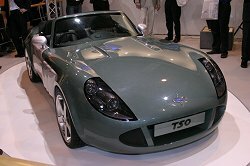 TVR didn't provide their usual show surprise and instead were content with a face-lifted Tuscan (called the Tuscan 2). As ever the stand was full of vibrantly coloured cars including the Typhoon and the jaw droppingly aggressive Sagaris. We dropped in on a rare occurrence across the hall, as Marcos unveiled a new model: the TSO. Bearing a strong resemblance to recent TVRs (the TSO was designed by the same man who styled the Cerbera), the TSO is powered by two variants of the 5.7-litre Corvette engine. A kerb weight of under 1100 kg promises astounding performance. Prodrive have been brought in to sort out the chassis of the TSO to ensure the handling complements the huge performance on tap. Morgan showed no less than three new cars in Birmingham. The 3.0-litre "budget" Roadster replaces the Plus Eight with a track car variant also available. A revised Aero 8 was also shown, though still sporting the odd, cross-eyed nose. Morgan predicts that the new models will increase their sales by 15%. Surprisingly, the biggest news from the sportscar makers was on the Noble stand, with a new cabriolet M12 revealed to a warm reception. The gathered crowds were not quite ready for what was to become the star of the 2004 show - Noble's first supercar: the Noble M14. Other cars on display worth a mention include the fabulous Aston Martin DB9 (a Volante version was also on display), the opulent Bentley Continental GT, Vauxhall's hard new VXR220, the Brabus Smart Roadster Coupe, MG X-power SV-R (though displayed in a dubious baby blue colour), and don't forget the Range Stormer concept hidden away in a corner of the American Express stand. This year's show made a big play of the word "live". More than ever live action and activities were the focus. A live theatre show, taster drives, an off-road track, a stage show on the Ford stand and another stunt display from Mini offered some movement in the normally static world of car displays. Motropolis offered a first class stunt display featuring various vehicles from the sponsors Honda, Renault and Jaguar - the highlight of which was a rare chance to see an XJ220 in motion, alongside the RD-6 concept car. Tyre smoke, the stench of burning rubber, lights, music and noise ensured a really exciting show with a clever script ensuring some tongue in cheek digs at government and police policy alike. The other high profile event was the Thunderbirds show on the Ford stand. Highlighting the company's product placement in the upcoming movie, the Ford stand was dominated by what was effectively a huge film set. The show itself was pure cheese, but kids loved it and it was certainly a departure from the norm. Some raised viewing areas should have been available, but at least Ford made an effort. Some manufacturers didn't even consider the show to be value added in terms of advertising and didn't bother showing up. 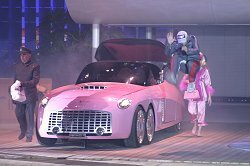 You have to applaud the Motorshow Live's organisers for trying to inject some life and movement into the affair but a crying shame they charged so much for it. The Motropolis show may have been a live action advert but was genuinely worth seeing - it should have been free. Kudos as well to Ford for trying to add some sparkle and endeavouring to make the show exactly that. Shiny cars bedecked with pretty girls isn't enough anymore; Ford's stand was probably a glimpse of things to come from the manufacturers if they are to showcase new models effectively. The motor show has a future and this year's event is promising in terms of addressing its shortcomings but the one missing link will always remain. How do the manufacturers give the public the real driving experience we crave? With no British Motor Show in 2002, the 2004 show, now entitled "The Sunday Times Motor Show Live" is eagerly awaited by enthusiasts and car buyers alike. Despite the absence of BMW and Mercedes-Benz, the show promises to be a good one. Here are some of the cars of interest on display. Small car manufacturer Daihatsu is exhibiting its full range including the YRV turbo and Copen sportscar. The future of their technologies will also be on display in the shape of the 170 mpg UFE hybrid car. Citroen's C2 does a star turn in the Motropolis spectacular show and on their stand in its Super 1600 rally guise. The motorsport thread is continued with the Xsara WRC and VTS and the strong selling C2 VTR. Other models include the C3 XTR, Picasso 110 Hdi and the Pluriel 1.4Hdi. Over on the Honda stand there are four cars vying for your attention. First up is the HSC, which has recently been confirmed as the replacement for the second focal point, the NSX, in this case the sublime Type R. At the opposite end of the scale Honda are also showing their latest hybrid, the IMA and the future of their hybrid technology, the IMAS concept. These concepts debuted at the 2003 Tokyo Show, but it is the first time Honda has brought so many concepts to the UK show. Hyundai's fantastic HCD8 concept coupe will be on display, but only until 31st May bizarrely. The CCS case study will also be shown as the manufacturer assesses its commercial viability. In terms of production models, the Korean marque shows its complete range including the award winning Getz and the all-new Tucson SUV. Land Rover's new Discovery 3 TDV6 will make its world debut joining the V8 model unveiled in NYC in April. A full line up of the recently revised Freelander and the Range Rover range will also be on display. Mazda's multi award winning RX-8 takes pride of place on the Japanese manufacturer's stand, ably supported by the capable Mazda2, Mazda3 and Mazda6 ranges and the evergreen MX-5. Morgan will unveil two new models in its range. Firstly, a replacement for the plus 8; the Roadster is powered by a 3.0-litre V6. The second model is a track-orientated special about which Morgan has released very little detail. Recently rejuvenated Nissan is building on the success of the 350Z by launching an SUV based on the sports coupe's running gear - the Murano. With many shared styling cues, both external and internal, this design ideology looks to be the way forward for Nissan. Set to cost the same as a BMW X3 whilst being the same size as an X5, the Murano is aimed to push Nissan further into the lucrative SUV market. Also on show is the company's innovative new LDW (Lane Departure Warning system) that warns drivers when they err from their lane on the motorway. Peugeot will show its new 407 saloon and SW models. Said to offer class-leading packaging and dynamics, the 407 is one of the highest profile models at the show. Maintaining its place at the forefront of diesel progress Peugeot also shows hot hatch versions of the 206 and 307 equipped with 110 and 136 bhp HDi engines respectively. The Altea is SEAT's latest model and takes its UK bow at the NEC. Marketed as an MSV (multi sports vehicle), five variants will be on display. Also debuting is the Ibiza Cupra, the latest in a line of popular sporty SEATS, the Cupra will be available with a 160 PS diesel engine or a 1.8-litre turbocharged 180 PS petrol unit. The highlights of the Toyota stand are limited to a face-lifted Corolla including an all new Verso variant and the current MR2 and Celica Red Collection limited editions. On the Vauxhall stand will be the new premium performance range titled VXR. Cashing in on the continued success of VXR in the BTCC, initially two models will be VXR'd up: the Monaro and the VX220. The former is boosted up to 380 bhp for £35,595, looking like one of the conspicuous bargains of the show. Also on show are the new Tigra and the crucial new Astra aimed at finally toppling the Focus from its perch. Volvo continues its assault on the premium sector with the S40 saloon and the new V50 Sport Wagon, aimed squarely at the lifestyle estate market. Facelifted versions of the S60,V70 and XC70 will also be shown. The continued pursuit of advanced safety features is also on show in the shape of the Blind Spot Information System, which detects hidden road users via sensors on the wing mirrors. More stories and image galleries below. The Ferrari Scaglietti has divided opinion with its looks - the NEC was the UK's first chance to sample it. Fiat showed the Panda for the first time in the UK at the British Motor Show. It is already a sales success. Despite being one of the smallest exhibits, it was undoubtedly one of the biggest stars at the Geneva Salon; the stylish little Trepiuno concept has done it again, this time in Birmingham. Fiat's Multipla was always a great car, just a little odd looking. The new sober design was on show in Birmingham. 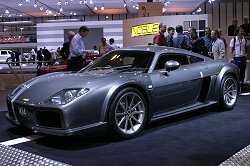 James Jenkins noticed the rather tasty GTM Libra and Spyder at the NEC. Will the rest of the world take notice? Maserati is going places, and its display at the Motor Show Live reflects the historic marque's burgeoning resurgence. MG Rover has released teaser photos of the much-needed replacements for the Rover 45 and MG ZS. 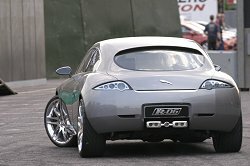 The cars will be officially launched at the 2004 British Motor Show (tagged "Motor Show Live!") where we will get to check out the new interior as well as the facelifted exterior. You don't normally associate the word "sporting" with a Mitsubishi MPV. That is set to change with the new Grandis. Noble stole the show in Birmingham when the new M14 supercar was revealed. We were there. Hot on the heels of the first official photographs of the next generation 911, Porsche has announced that the 911 Turbo S will make its world debut at the British Motor Show. Renault's new Modus will debut in production form at the forthcoming Motor Show in Birmingham. The Modus was first shown at the 2004 Geneva Show, and is brimful of novel practical features such as a split rear tailgate. It sits above the Clio in the Renault range, as a Clio-sized MPV almost. We will tell you more after the show in May. Vauxhall launched its exciting new VXR brand at the British Motor Show. We were there. 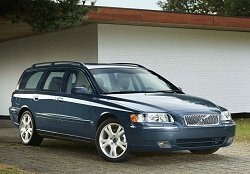 The Volvo V50 Sportswagon is a desirable new alternative to the BMW Touring and Audi Avant.